Gold is coveted not just by Olympic athletes, but also by the common men and women. It’s really not surprising with the direction that gold is moving this year. Gold prices had their best quarterly performance in 30 years during the first three months of this year, climbing up by 24% so far this year. But it is still 30% off its all-time high of US$1,889/ounce set in August 2011. Gold prices could climb another 30% just to reach its previous peak. But there are reasons to believe gold could blow right past its previous high. To try to stimulate economic growth, countries around the world and their central banks have been doing everything they can to push down interest rates. This includes buying up their own bonds, because more bond buying means higher bond prices and lower bond yields – which drives lending rates lower. 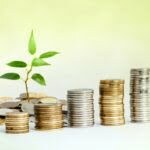 Their thinking has been that if people spend more and invest more (with borrowed) money, global economy growth would pick up. When money becomes cheaper to borrow, more people will borrow. They’ll use that “nearly-free” money to buy more cars, and to take on more student debt and more home mortgages. And in theory, businesses will borrow to reinvest in factories or employees and produce more economic growth. They also started printing and borrowing more money to fuel their economies. Between 2008 and 2014 world debt grew by US$57 trillion to US$199 trillion. It is now believed to be well over US$200 trillion, with the world’s debt-to-GDP ratio now stands at over 250%. This is completely unsustainable. Malaysia’s government debt-to-GDP ratio, based on debt of RM631 billion, is relatively reasonable at 54% (for comparison, Japan’s is 229%). But that’s close to the government’s self-imposed limit of 55%. Unfortunately, all the extra debts are not helping the global economy grow. It’s now at the point where every extra dollar of debt is hindering growth instead of promoting it. 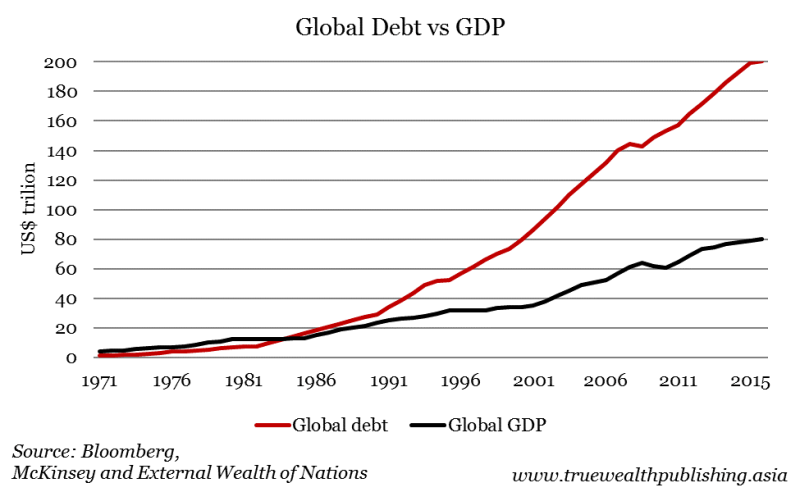 As shown below, global debt growth is growing at a much faster rate than global GDP. This wasn’t the result central bankers were looking for. However, instead of cutting back, they’ve doubled down… with negative interest rates. Negative interest rates mean the borrower doesn’t compensate the lender with interest. Instead, the lender pays the borrower to take his money. There is now US$13 trillion worth of negative-yielding government bonds in the world. And these are from developed countries like Germany, Switzerland and Japan. Negative rates mean the value of your money erodes. For example, depositing RM500 at -1% interest in the bank doesn’t earn interest. It loses it. It’s worth RM495 next year. You’re guaranteeing a loss on your hard-earned money. Even before factoring in inflation and fees. Fortunately, Malaysia does not have negative-yielding bonds yet, but yields have been falling. At the end of 2015, a 10-year Malaysian government bond yielded 4.2%, but it has dropped to 3.5% now – a 16% drop. It’s truly a world flipped upside down. We’re seeing the unintended consequences playing out today, and they’ll accelerate as central banks continue their flawed experiments. This makes it even harder to forecast the outcome of the usual investments such as bonds and stocks. As a result, investors are fleeing to the safety of gold, which sends gold prices higher. China is the world’s largest gold miner and importer. Data suggests Chinese gold imports increased from about 100 tonnes in 2010 to nearly 1,000 tonnes last year. Part of that has been on behalf of the Chinese government, which has been increasing its gold reserves. Some feel China is on a gold-buying binge because it wants to back its currency – the renminbi – with gold, and eventually replace the U.S. dollar as the global currency. But the real reason is a lot less exciting. Like any smart investor, China is simply diversifying its holdings. 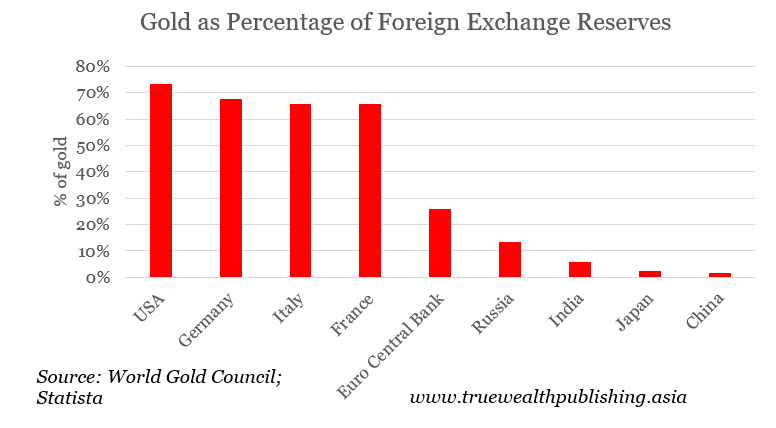 China’s gold reserves remain a tiny portion of its overall foreign exchange reserves – only about 1.6%. For comparison, the number for the US is 73%, Germany is 67%, and France and Italy are 65% respectively. Malaysia has a similar ratio to China’s – at 1.5% of our reserves. Given the size of China’s economy it should own more gold, just like the other big players in the global economy. China has over US$3 trillion in foreign exchange reserves. Converting even a small portion of that into gold means they are going to be buying a lot of gold. Then there is the Muslim world. Muslims have always been able to own gold, but holding it as an investment has not always been clear. This is because under Islam’s Syariah law, gold is considered a “Ribawi” item, which means it cannot be traded for some future value, or for speculation. But the World Gold Council (WGC) and the Accounting and Auditing Organisation for Islamic Financial Institutions (AAOIFI), which establish Syariah standards for Islamic finance, are drafting standards for investing in gold to comply with Syariah law. The proposed Syariah-compliant gold standard states that gold investments must be physically backed by gold, hence, gold futures, which typically are not backed by physical gold, would not comply. However, the draft of the gold standard outlines several approved uses for gold, including investment accounts, derivative contracts, Islamic bonds, and exchange traded funds (ETFs). The WGC estimates that this new gold standard could unlock hundreds of tonnes worth of extra gold demand from Muslim investors. To put that in perspective, total worldwide gold demand in the first quarter of 2016 amounted about 1,290 tonnes. That was an increase of about 180 tonnes, or 16% from the fourth quarter of 2015. Not coincidentally, the price of gold rose 17% in the first quarter of this year, the biggest quarterly gain since 1986. So, hundreds of tonnes of extra demand, plus all of China’s gold buying, should support gold prices for years to come. Besides finding a reputable dealer to buy physical gold, there are two other good ways to own gold. 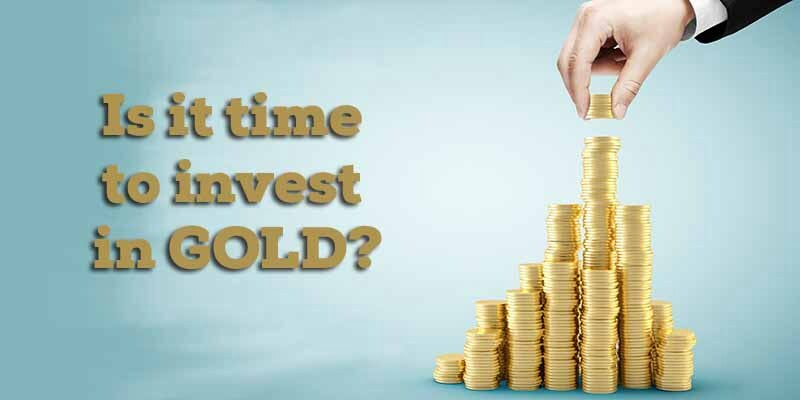 A gold investment account, which is offered by a number of financial institutions in Malaysia, is an easy and attractive option that allows you to put money into gold without needing to physically store it. Also, you can own gold using an ETF. There are none that trade on the Bursa Malaysia, but you can buy the SPDR Gold Trust on the Singapore exchange (code: 087). This ETF is backed by physical gold bullion and allows investors to track gold prices. If you can trade on the Hong Kong Stock Exchange, you can also try the Value Gold ETF (code: 3081). Besides finding a reputable dealer to buy physical gold, you can also own gold using an ETF. There are none that trade on the Bursa Malaysia, but you can buy the SPDR Gold Trust on the Singapore exchange (code: 087). This ETF is backed by physical gold bullion and allows investors to track gold prices. If you can trade on the Hong Kong Stock Exchange, you can also try the Value Gold ETF (code: 3081). There are other compelling reasons to own gold. True Wealth has outlined all of them for you in a free 22-page special report that you can download here.